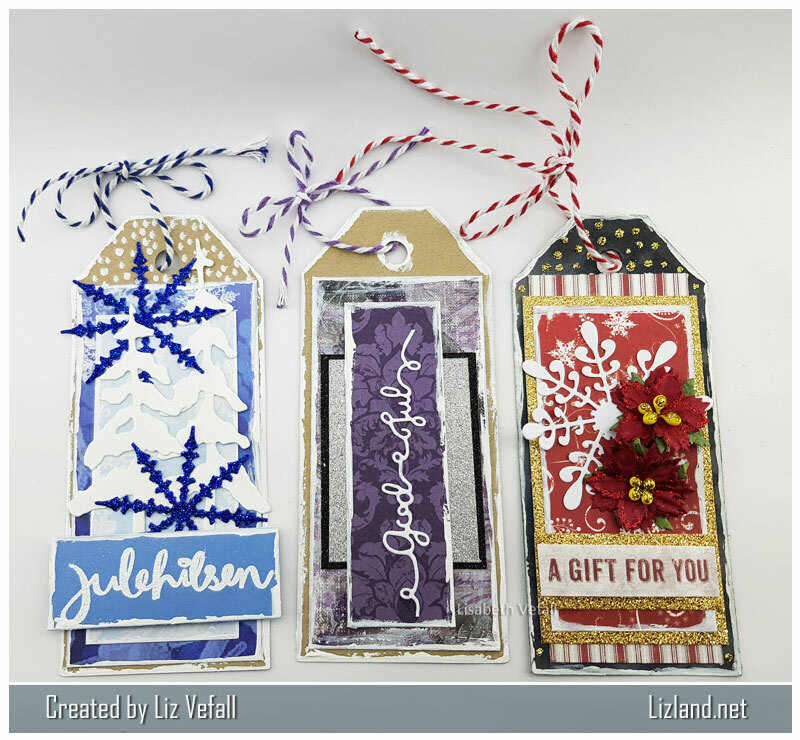 Have you ever tried to make your own Christmas tags? These are the first I’ve tried making. Siv kindly made me some tag blanks that I could decorate and I’ve had fun doing it. It is a great way to use left over scrapping papers, that’s for sure. 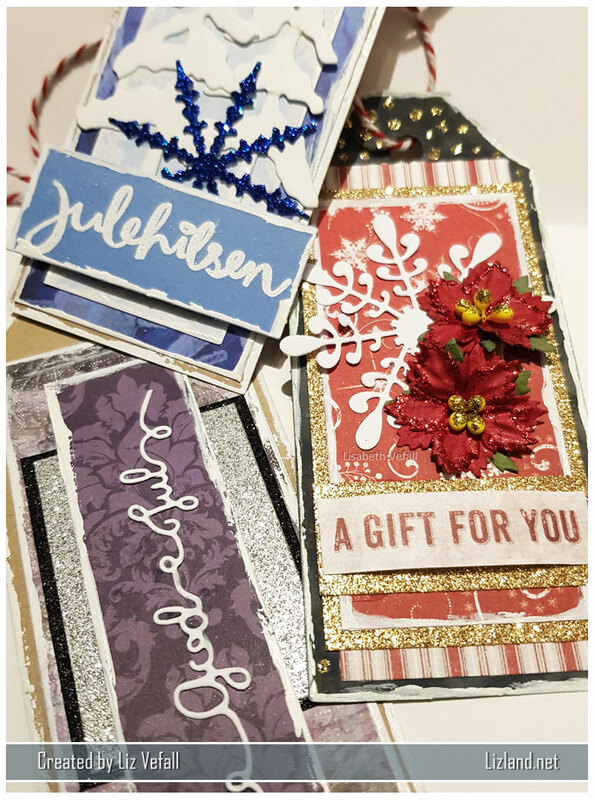 The dies here are by Noor Design and the text on the red is from Maja Design paper and on the blue is a Norsk Stempelblad stamp. The red flowers are by Papirdesign. The text die here is by Kaboks. Day two of the daily posts through December is here. 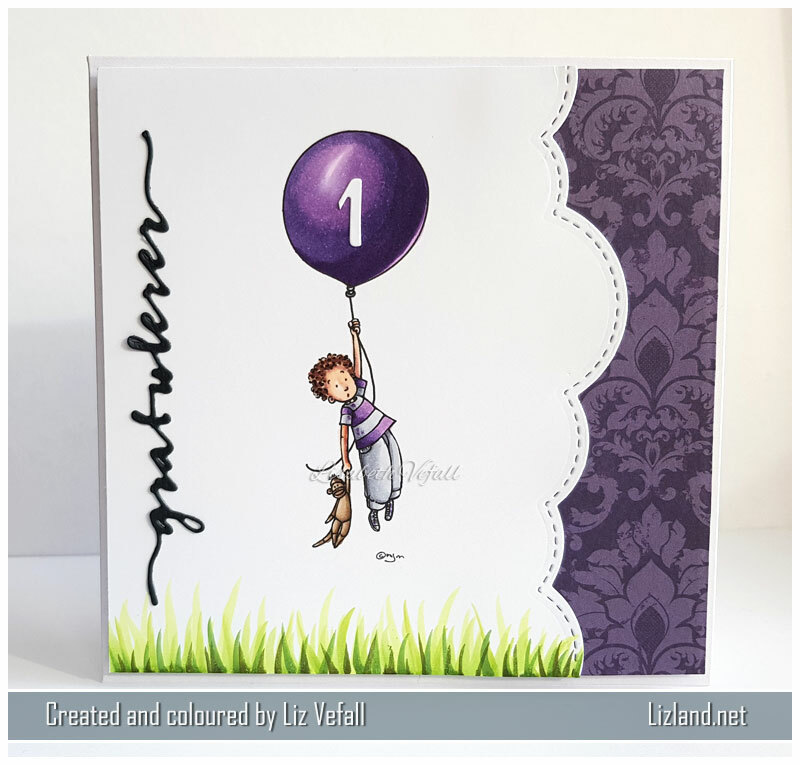 This time it is a birthday card. A clean and simple one at that. I’ve used a Mo’s Digital Pencil image and Copic Markers. The three dies are from papirdesign (gratulerer), Kaboks (the 1 is a cut off M ;)) and Linda Design (border) I got at Papirgleder. I drew in some grass at the bottom to make it look like he was indeed flying away. I’m dreaming of a white Christmas. It’s been a while since we had a proper white one, so perhaps we get lucky this year! This card was made for a card swap and my partner was someone in Australia who had moved there from England. 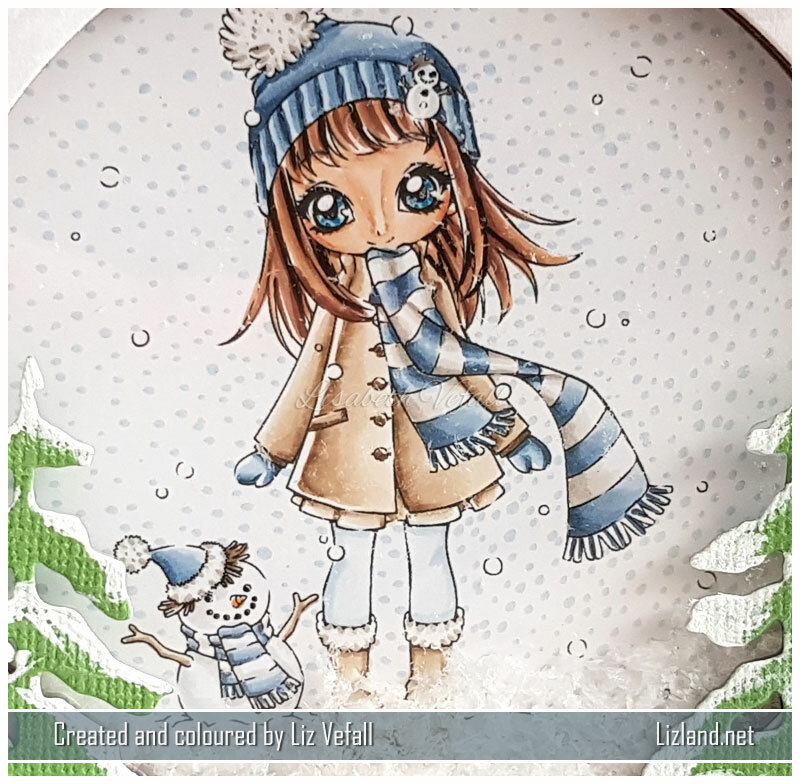 I figured snow was one of the main things she would no longer get around Christmas card, hence a cold, white, snowy card! Thankfully the card made it there just fine, so now I can post it up here, yey! 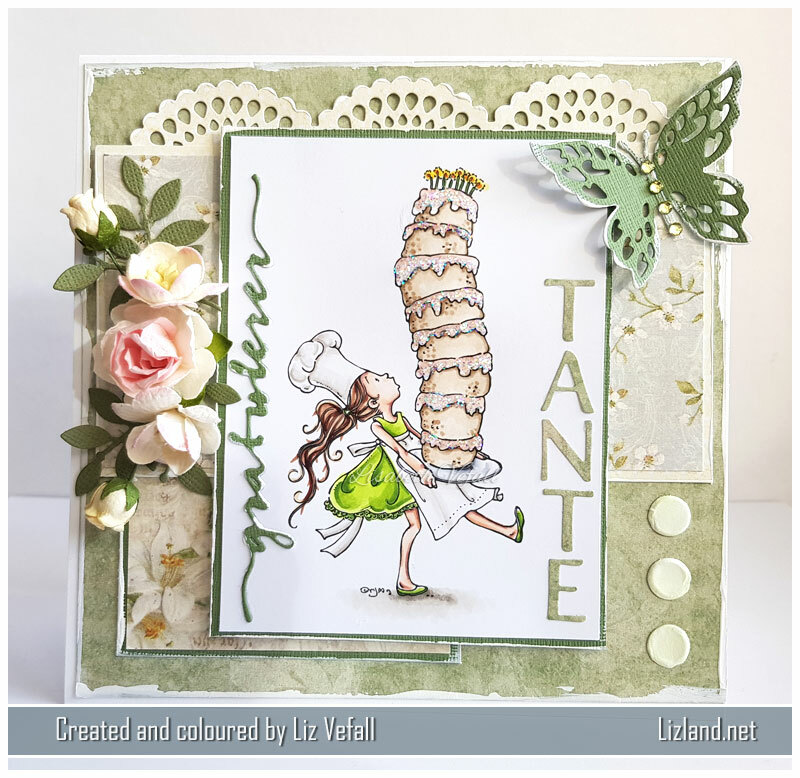 I’d only made one shaker card before I made this one, and this time around I decided to make the image sort of inside the card instead of adding the shaker part as the outmost part of the card. I think it looks pretty cool like this. The stamp is Winter Stella with her little snowman. Isn’t it supercute? It’s from Make it Crafty. 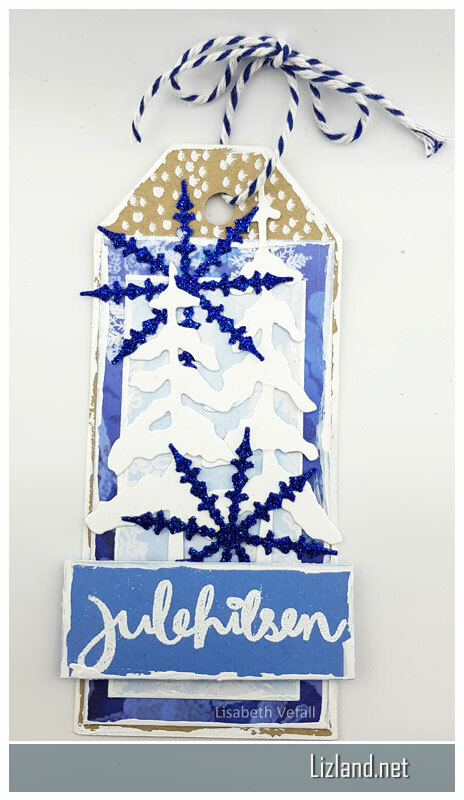 I’ve used Noor Design trees and the sentiment is cut out using blue foam with a die by KaBoks. 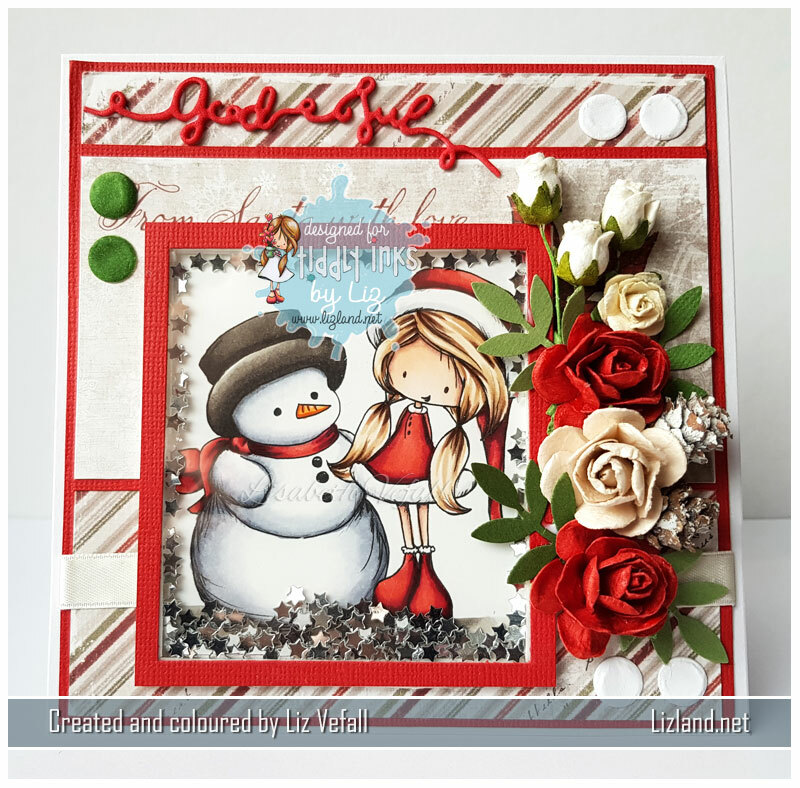 This is how it looks with the snow inside the shaker card all over the image. I’ve been enjoying colouring up images by Mo’s Digital Pencil the past couple of weeks. This tall cake one I bought specifically to use for a couple of birthday cards I had coming up. Isn’t she the best?! For the cake my sister insisted I needed to have some glitter. I used mostly transparent glitter, but with a bace layer of R00 and R12. As you can see from the colour list below, you don’t need to use a lot of Copics to colour up a pretty image and make it into a card. This time I stuck with just 2 colours for most of it, sometimes 3 if I was colouring up bigger areas. It was fun colouring up a lighter image again after the very bright contrast ones I’ve done in the past few blog posts! 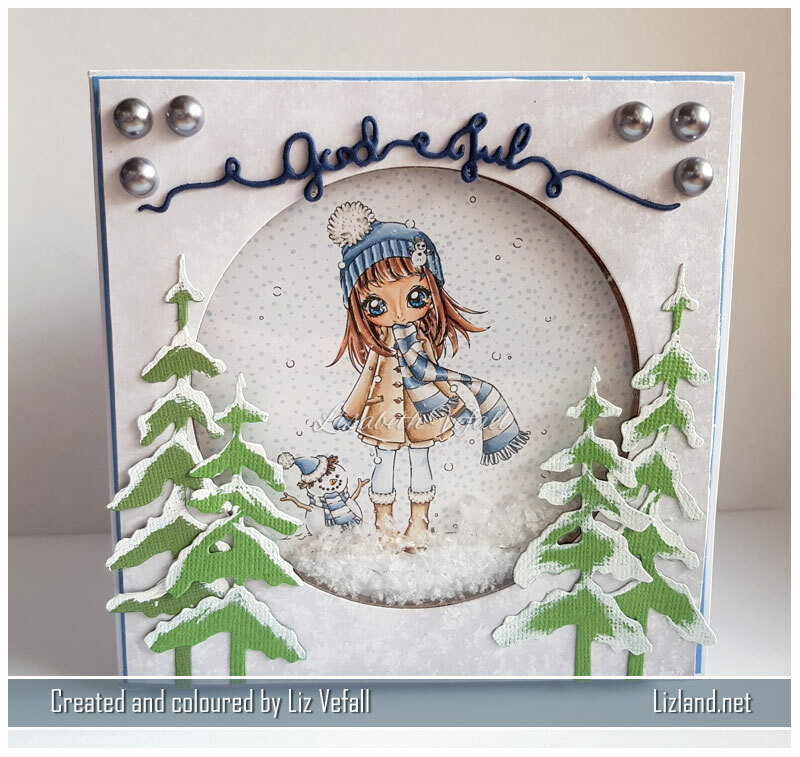 I’ve used a fair few dies on this card: butterfly and leaf die by Precious Marieke, border die by La-La Land, alphabet die by Kaboks and gratulerer by Papirdesign. The flowers are as usual by Wild Orchid Crafts. And I used a bit of white acrylic paint around the edges of most elements.